A PERSONAL MEMOIR ALL IN ONE. Goldie Alexander, successful author, lecturer and teacher, shows us how to document our own life histories. This guide offers a practical and stimulating approach that will lead you through the creative process from research, structure, crafting, to beginnings, endings, controversial issues and publishing. As well as offering practical hints for both experienced and novice writers, Goldie writes about her own early years and provides the reader with many examples of how these influenced her later work. 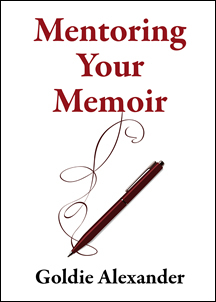 As a true resource, this may be the only ‘how to write a memoir’ book you’ll ever need.